In this blog, I’ll look at the impact of swapping on MySQL performance. It’s common sense that when you’re running MySQL (or really any other DBMS) you don’t want to see any I/O in your swap space. Scaling the cache size (using innodb_buffer_pool_size in MySQL’s case) is standard practice to make sure there is enough free memory so swapping isn’t needed. But what if you make some mistake or miscalculation, and swapping happens? How much does it really impact performance? This is exactly what I set out to investigate. To better visualize the performance of the metrics that matter for this test, I have created the following custom graph in our Percona Monitoring and Management (PMM) tool. It shows performance disk IO and swapping activity on the same graph. 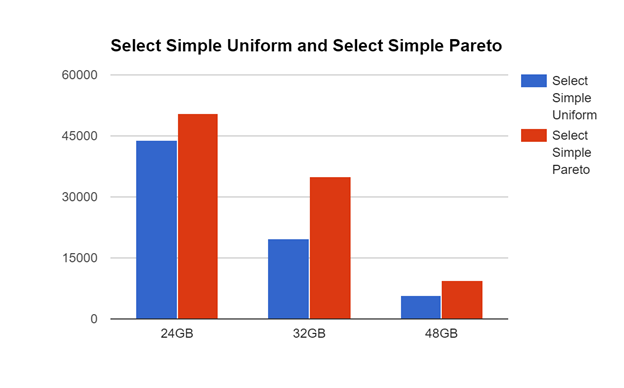 Here are the baseline results for innodb_buffer_pool=24GB. The results are a reasonable ballpark number for a system with 32GB of memory. As you can see in the baseline scenario, there is almost no swapping, with around 600MB/sec read from the disk. This gives us about 44K QPS. The 95% query response time (reported by sysbench) is about 3.5ms. Now let’s look at an even worse case. This time, we’ll set our configuration to innodb_buffer_pool_size=48GB (on a 32GB system). Now we have around 6K QPS. Disk IO has dropped to 250MB/sec, and swap IO is up to 190MB/sec. The 95% query response time is around 35ms. As the graph shows, the performance becomes more variable, confirming the common assumption that intense swapping affects system stability. Now the graph shows both good and bad news. The good news is that the feature works as intended, and after the resize completes we get close to the same results before our swapping experiment. The bad news is everything pretty much grinds to halt for 15 minutes or so while resizing occurs. There is almost no IO activity or intensive swapping while the buffer pool resize is in progress. I also performed other sysbench runs for selects using Pareto random type rather than Uniform type, creating more realistic testing (skewed) data access patterns. 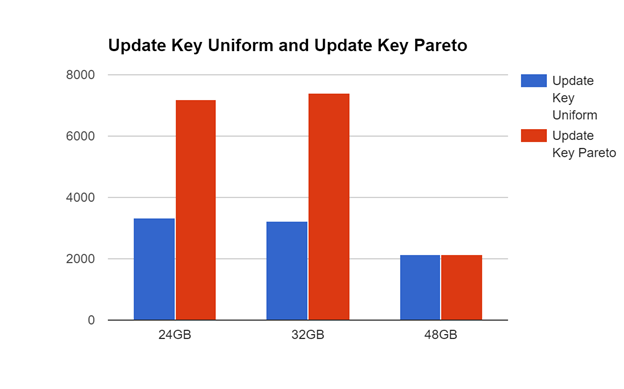 I further performed update key benchmarks using both Uniform and Pareto access distribution. As you can see, the results for selects are as expected. Accesses with Pareto distributions are better and are affected less – especially by minor swapping. If you look at the update key results, though, you find that minor swapping causes performance to improve for Pareto distribution. The results at 48GB of memory are pretty much the same. Before you say that that is impossible, let me provide an explanation: I limited innodb_max_purge_lag on this system to avoid unbound InnoDB history length growth. These workloads tend to be bound by InnoDB purge performance. It looks like swapping has impacted the user threads more than it did the purge threads, causing such an unusual performance profile. This is something that might not be repeatable between systems. While you should continue to plan your capacity so that there is no constant swapping on the database system, these results show that a few MB/sec of swapping activity it is not going to have a catastrophic impact. Peter, Thank you for a great article! Good thing to know that resizing online buffer pool will be quite costly. Can you state for the record what your swappiness was set to (presumably you tested on a Linux system)? Has this same test been done with the OS (and swap space) and Database all stored on one (non-SDD) hard drive? I would be very curious to see it too. If you do any benchmarks please share the link!